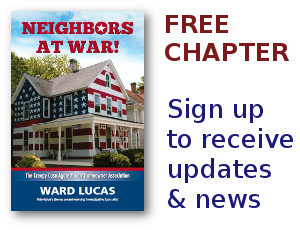 HOA Archives - Page 3 of 169 - Neighbors at War! HOA House Pretty In Pink At Lake Conroe! No Comments on HOA House Pretty In Pink At Lake Conroe! When will it end? The battle over a pink house rises again! Bella Vita HOA on Lake Conroe, Texas has declared a legal battle with Frank and Anna Manzo. The Manzo’s dream home has a shade of pink that was added after the basic HOA beige was approved. Oh my gosh! You would think the color of the house was going to cause the lake to dry up. No Comments on You Can’t Say We Didn’t Warn You! I was recently interviewed by the Kansas City Star, for their series, HOAs from Hell. While the story about my HOA was flattering, please don’t think for one second that I actually encourage folks to move into these Associations. I’ve said it millions of times, and I’ll say it again: “You are just one board member, manager or management company away from insanity.” Really, you are. Sometimes it takes a huge effort to get a movement started. It’s slow in the beginning, but like that one extra snowflake on a Colorado hillside, the avalanche eventually happens. Here’s another from homeowners rights activists in Arizona. All anybody on our network is talking about right now is the amazing series of stories in the Kansas City Star. Today’s paper featured an extensive story on the abuse and criminality going on in America’s Homeowners Associations. Well-researched, well-documented, and well-reported the Star again sets a national standard upon which all HOA stories should be based. This is not to diminish my respect for the Las Vegas Review-Journal which has long reported the organized criminal activities among Nevada HOAs and the corrupt public officials who oversee them. But reporter Judy Thomas has broken new ground with her story on the national HOA scam. For the past week I’ve been in the Pacific Northwest attending a 50th class reunion. What a thrill! I’m convinced that my high school classmates were some of the classiest people in the world. It’s rare that you make a friend who sticks with you for five years. It’s incredible when you can walk into a room and discover a roomful of people who are still your friends after five decades. Life is short folks and every day is a gift. Hold on to what’s true and fight for what you believe. If you know you’re right, never turn and look back. Your success in life is measured by how hard you’ve fought for others.